My first serious speakers were a pair of 2-way bookshelf monitors I built from a kit. My first serious speakers were a pair of 2-way bookshelf monitors I built from a kit. They didn't cost a lot, but they sounded amazing. The magic ingredient was the high-performance Dynaudio woofer and tweeter — those drivers looked a lot like the ones in the Excite X18. The X18s deliver Dynaudio's famously smooth, dynamic, three-dimensional sound, wrapped in beautiful furniture-grade cabinets — no assembly required! All Dynaudio woofers use the company's Magnesium Silicate Polymer (MSP) cone material. It combines low mass, high rigidity, and ideal internal damping, to respond instantly to music's constant ebb and flow. An MSP cone is molded in one geometrically-perfect piece, which helps to optimize sound dispersion. It also eliminates the need for a separate dust cap, further enhancing the cone's structural integrity. The woofer cone is also shallower than conventional cones. That improves off-axis response, so the sound you hear when sitting off to the side is closer to what you hear directly in front. That'll keep everyone happy when you have friends over and don't want to give up the "sweet spot." The X18 enclosures are ported to provide a bit of extra low-frequency oomph — but not enough to ever make these speakers sound boomy. A pair of foam plugs are included which you can insert in the ports to optimize bass response when placing the speakers near a wall. When Dynaudio's engineers find something that works, they stick with it. Core designs like the company's renowned soft-dome tweeters have been steadily improved and refined over the course of 40 years. The Excite X18's tweeter features a silk dome with a special coating that improves dispersion while eliminating high-frequency breakup. It sounds effortlessly detailed, neutral, and non-fatiguing, even when you crank up the volume. "Although I frequently borrow audio gear to try out in my home system, it's rare for me to actually replace anything. So when I took home a pair of the Excite X18s, I fully intended to bring them back. But after giving them a week of break-in time, and spending a few evenings listening to some of my favorite tracks on CD and vinyl, I knew I had to keep them. Dynaudio speakers love music as much as you do, and their expressive, transparent sound quality suits every kind of music, soft or loud, acoustic or electric. Those qualities also make for immersive home theater. They can reproduce extreme dynamic range, and they throw a big, seamless soundstage. 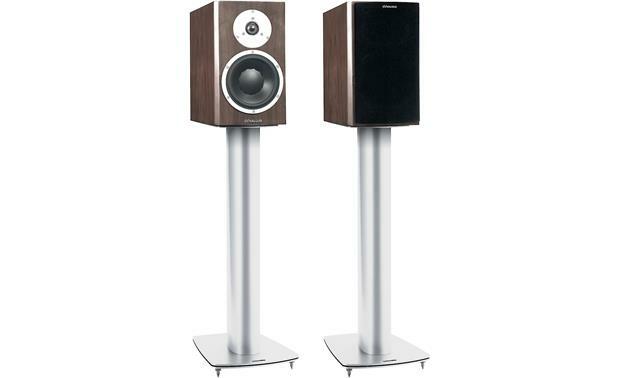 Although Dynaudio calls the Excite X18s "bookshelf" speakers, they will sound best placed on a pair of high-quality stands, and positioned at least a foot away from any walls. With 86 dB sensitivity and 4-ohm impedance, the X18s require a diet of high-current, high-quality amplification. The X18s have more low-end punch than the smaller Excite X14s, but for truly full-range sound, we still recommend adding a high-quality subwoofer. Two-Way Bookshelf Loudspeaker: Dynaudio's Excite X18 bookshelf speaker features a 1.1" precision-coated silk soft-dome tweeter and one 6.6875" magnesium silicate polymer (MSP) mid-woofer for true high-end sound with great dynamic range, expansive soundstage, exceptional accuracy, and a natural tonal balance. 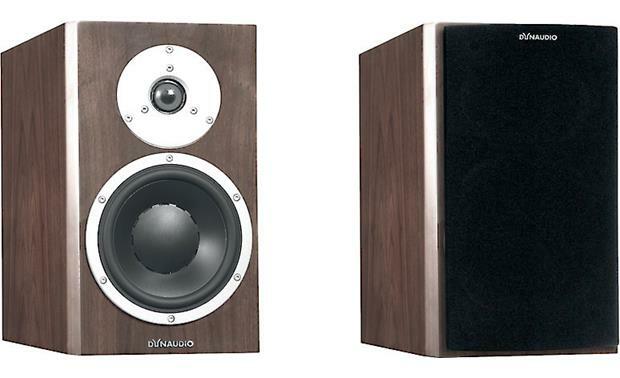 The minimal distance between tweeter and mid-woofer serves to improve timing and phase. Furniture Grade Cabinets: Dynaudio's high-quality, furniture-grade cabinets are painstakingly assembled and finished by experts in Skanderborg Denmark to make sure the enclosure perfectly matches the custom drivers. The Danish tradition of craftsmanship drives the meticulous process of selecting and matching veneers from the finest woods available, followed by careful sanding, polishing and coating. The front-baffle is manufactured using CNC (Computerized Numerical Control) machining. Computer-programmed and controlled by ultra-responsive sensors, precision to within a single micrometer (ìm), multi-axial drilling machines produce the acoustically optimized baffle shape and unique design details. Additional internal damping, strengthening, and bracing in critical sections of the cabinet substantially reduce unwanted resonance. 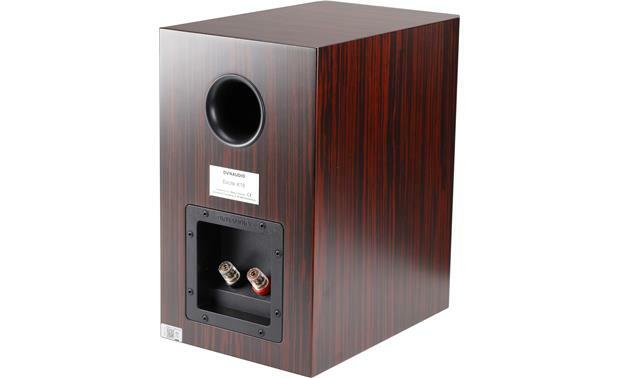 The Excite X18 cabinet also features a magnetically-attached, acoustically-optimized front grille. Heavy-Duty, Gold-Plated Binding Post: The Dynaudio Excite X18 bookshelf loudspeaker is outfitted with a set of heavy-duty, gold-plate binding post terminals for secure connectivity and excellent signal transfer. The binding posts will accept bare wire (up to 10AWG), pin-connectors, and banana plugs (single only). Applications: The Dynaudio Excite X18 bookshelf loudspeakers are designed to offer advanced performance in both stereo and multichannel applications. Mounting Options: The Dynaudio X18 bookshelf loudspeakers are designed to be placed on a speaker stand, shelf, table, or other piece of furniture with a solid flat-surface. The X18 doesn't provide a mounting bracket, keyhole slot, or threaded insert to wall-mount the speaker. However, you can use the PinPoint side-grip wall-mount bracket (sold separately - see Accessories Tab) to mount the X18 loudspeaker to the wall.